We often focus on how our gifts can help those in need. But the act of giving actually improves our own lives as well. 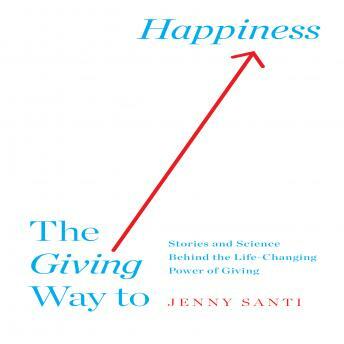 In The Giving Way to Happiness, Jenny Santi overturns conventional thinking about what it takes to be happy by revealing how giving to others-whether in the form of money, expertise, time, or love-has helped people from all walks of life find purpose and joy. Drawing on the wisdom of great thinkers past and present, as well as cutting-edge scientific research, Santi makes an eloquent and passionate case that oftentimes the answers to the problems that haunt us, and the key to the happiness that eludes us, lie in helping those around us. This book is filled with inspiring stories told firsthand by Academy Award winner Goldie Hawn, Noble Peace Prize winner Muhammad Yunus, supermodel Christy Turlington Burns, Teach for America founder Wendy Kopp, philanthropist Richard Rockefeller, environmentalist Philippe Cousteau, activist Ric O'Barry, bestselling author Isabel Allende, ALS survivor Augie Nieto, and many others from all over the world. Despite their diverse backgrounds, they have all found unexpected happiness and fulfillment through giving. This book tells us not just how they changed the world but also how their acts changed their very own lives. -The unexpected reasons why those who "gave it all up" to make a difference, and who face the direst situations, are nevertheless some of the happiest, most fulfilled, and least angst-ridden people you'll ever meet.